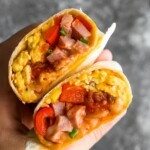 Ultimate breakfast burrito recipe- with eggs, ham, salsa and cheese, these breakfast burritos are going to keep you satisfied. Easy to make ahead and freeze for make ahead breakfasts. 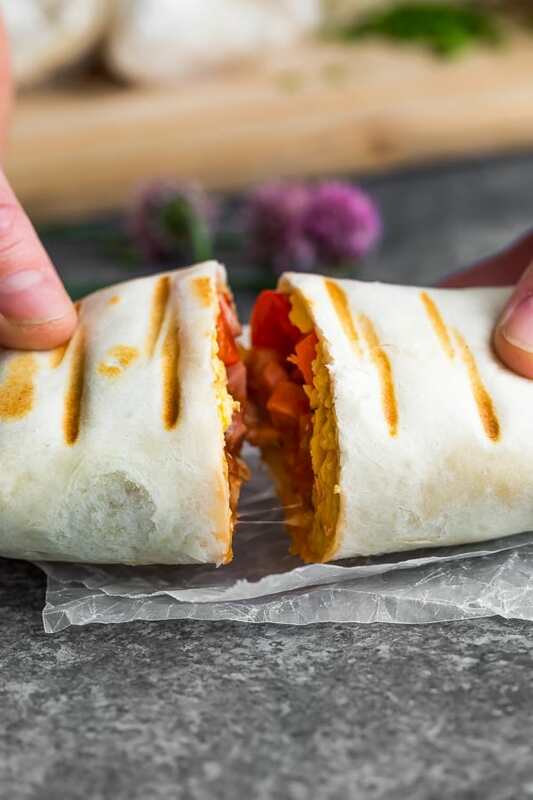 It’s no secret that we love breakfast burritos! Not only are they delicious, but they are one of the most filling breakfasts. I find eating a breakfast burrito often keeps me full until lunch time! I have had plenty of ‘healthy’ breakfast burrito recipes on this blog with fun flavor twists, and today I’m sharing the ultimate breakfast burrito recipe…let’s think of this as a more ‘classic’ breakfast burrito. With eggs, cheese, ham and salsa. Don’t worry, I still snuck in some extra veggies (I can’t help myself!). 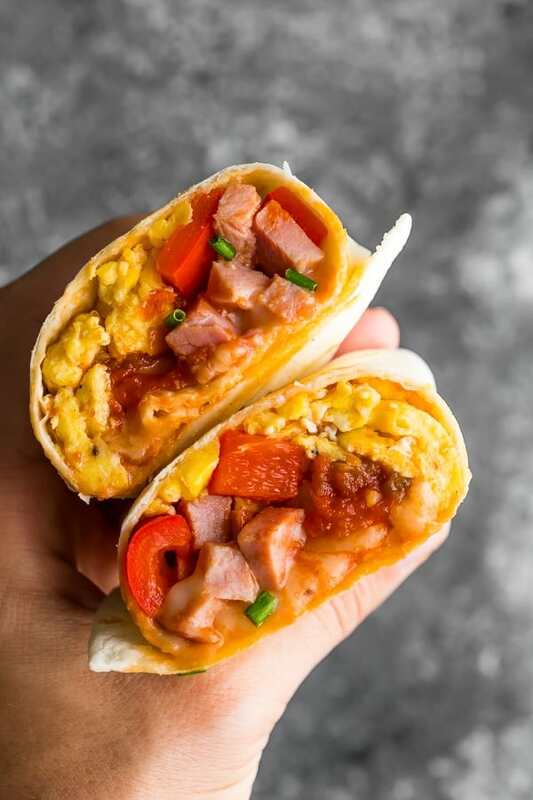 Assemble your burritos: eggs, ham, bell peppers, cheese and a dollop of salsa. The best part about these breakfast burritos is that you don’t need to cook them after rolling them. You can save that for right before you serve them! To re-heat- I recommend a sandwich press or a George Foreman type of indoor grill. This gets them nice and crispy with no need for extra oil. You can also cook them in a fry pan for a few minutes per side. How to roll a breakfast burrito? Once I have my fillings on top, I fold the sides over and then roll the top over. It’s important to not overfill the burrito so you can roll it nice and tight. Can I swap XYZ? Think of this ultimate breakfast burrito recipe as a base recipe and swap in what you’d prefer! Do you like bacon? Swap it for the ham. Hate bell peppers? Leave them out or add in your fave veggies. I like spinach, mushrooms, onions, cauliflower rice or even finely chopped broccoli. Not a fan of salsa? Leave it out! 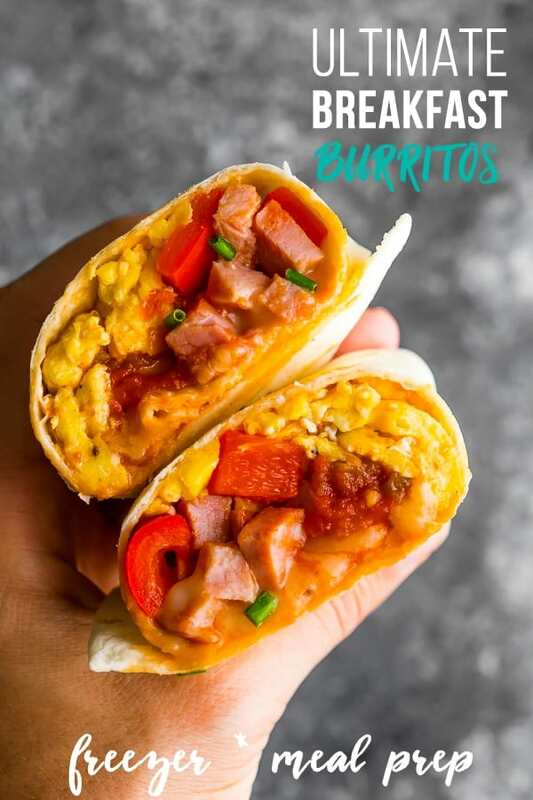 If you are serving these breakfast burritos right after cooking, you could add in some guacamole! Looking for more freezer breakfast burritos? 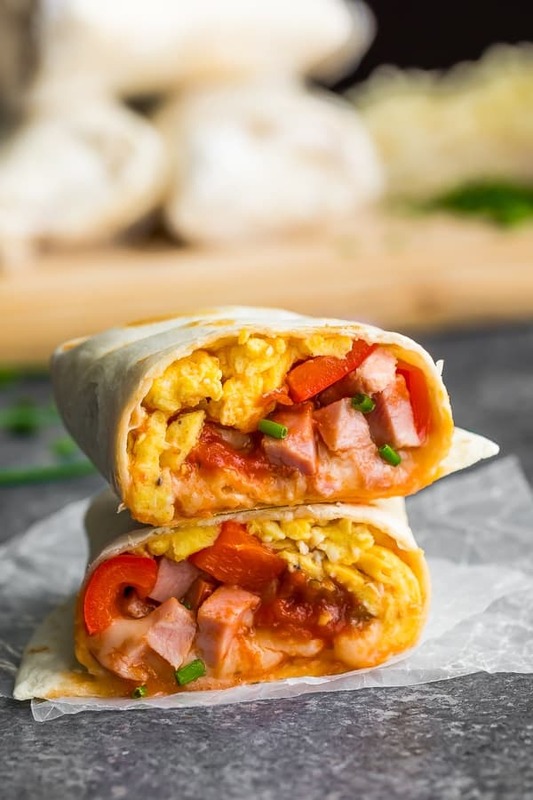 I’ve got you covered with these delicious and healthy freezer breakfast burrito recipes! Make sure you use the large (12 inch) flour tortillas. Thaw overnight in the fridge, or if you forget, in 30-second increments in the microwave on a paper towel. Heat 1 tablespoon of olive oil over medium heat in a non-stick pan. Add the bell pepper and cook for 5-7 minutes, until soft. Transfer to a plate and allow to cool slightly. In a large bowl or measuring cup, beat the eggs. Stir in the salt and pepper. Add the remaining 1 tablespoon of olive oil to the pan and then add the eggs. Cook, scrambling with a spatula, for 3-4 minutes until cooked through. Set aside to cool slightly. 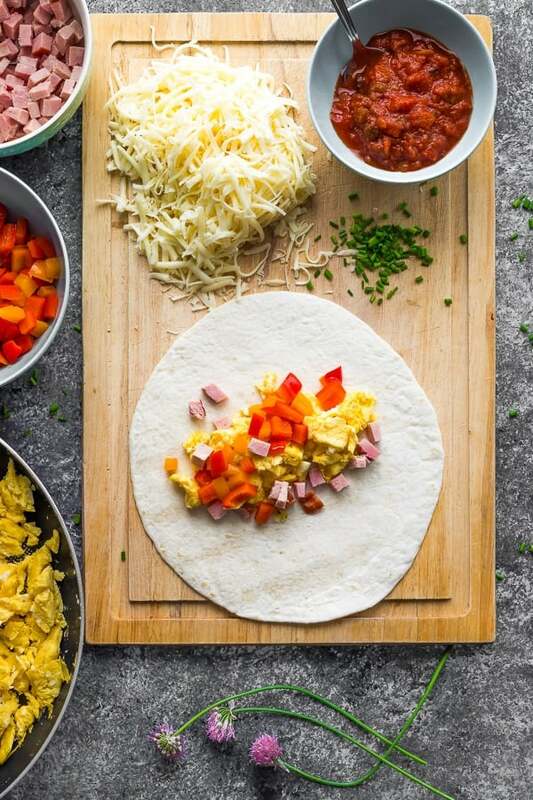 To assemble breakfast burritos: place a large tortilla on a cutting board. Top with 1/8 of the egg mixture, a few spoons of bell peppers, ham and shredded cheese, and a spoonful of salsa. 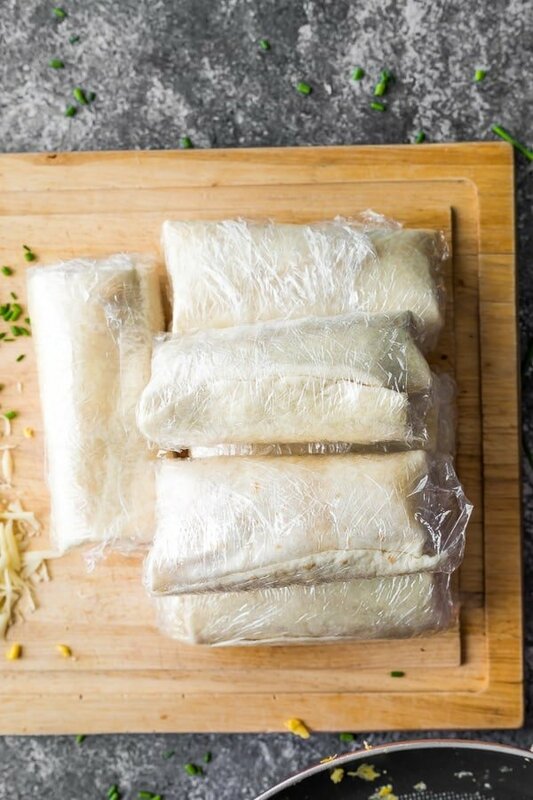 Roll burritos by folding over the sides, then the top. Roll tightly, then wrap in plastic wrap. Store in the fridge for up to 3 days. Freeze by placing wrapped burritos in a larger reusable bag or storage container for up to 3 months. Thaw in the fridge overnight or on low power in the microwave. Crisp up on an indoor grill or in a frying pan. Not only were the burritos tasty and packed with protein, but attractive as well! Plus we now have some frozen burritos to enjoy in the future. Win win! Frozen burritos make me happy, too! Glad you enjoyed!